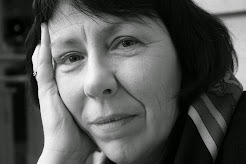 Janet Henderson writes on social justice, community development, theology and the future. Social Media Enhancing Well Being. 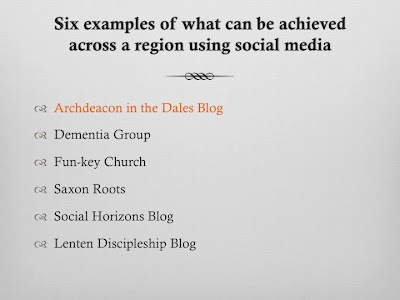 In this presentation I want to concentrate on the use of social media to promote relationships and projects which happen in time and space that it not digital. I think that the distinction often made between the 'real world' and 'digital world' is false. Things that profoundly affect our lives happen in both spheres - digital and non-digital - and the church must respond to this and, more than simply responding, give some help and leadership in thinking about the ways the one sphere influences and shapes the other. And let us not be afraid. We have a God who became incarnate as Word so Christians above all ought not to be afraid of exploring new forms of communication. I confess to you at this point that I am no expert. In 2010, I knew next to nothing about the phenomenon we now call social media. I had never used Facebook or Twitter and I was one of the brigade who secretly thought they were probably a bit of a waste of time. Then came a snowfall. Now in Finland that would have been unremarkable, but in Britain the lightest of snowfalls causes a crisis; roads become unusable, trains fail to run, schools close and the whole country grinds to a halt! I used what was, for us, a heavy snowfall in November 2010 to stay indoors and start a blog. I had been encouraged to do this by David Brighton, our Diocesan Webmaster, and I shall be eternally grateful to him for setting me off on a new new adventure. My message is that anybody can learn to use social media; the opportunity to use it for good rather than for harm is there for the taking. 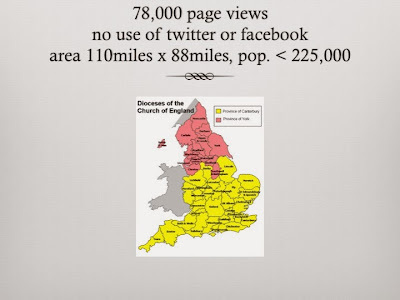 My use of social media in my ministry has not been about generating large numbers of followers or about getting huge numbers to read what I'm writing. I have not even actively promoted interaction online as I have known that I've had little time to read and moderate comments, though I am always grateful to receive them. The focus of my use of social media has always been about building relatively small communities of interest that make a difference. I'll repeat that - 'relatively small communities of interest that make a difference.' These have been communities with a common purpose that can get things done and/or offer support. A large part of my use of social media has been about increasing trust between people. Today I'm going to give you 6 examples of how that can happen, some examples are my own work and some the work of others or the work of several people as so often happens on the internet when one person picks up another's idea, adds to it and runs with something new. First, however, a warning from history! These are the forms I am familiar with. I use Twitter for political comment and regional networking, supporting local causes, events and interest groups, and promoting tourism in the area. I also use it to direct people to my blog. Facebook I use to stay in touch with friends and particularly with former students. I think that I am probably part of the first generation of university lecturers that has been able to follow the career paths and ministries of many of my students and this is a constant source of pleasure as well as helping me to do my job and to find resources! I also use Facebook to point people to my blog but I try not to overdo this as not everybody goes on Facebook to read blogposts! I use Linkedin exclusively for professional development and to join communities that will help me to increase my knowledge in my own field of expertise. Google+ I find scary - it appears to me to make links you didn't authorise or anticipate! To date, the blog has had over 78,000 page views. I purposely did not use Twitter or Facebook to promote it. 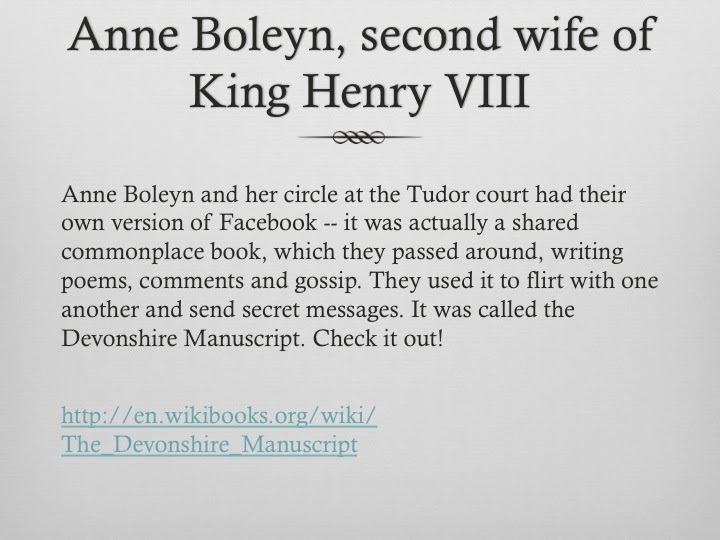 The readers to whom it was directed were largely church wardens and other church officers, many of whom were not used to social media and, in some cases, were highly suspicious of them. I decided that if I told them that the blog was like an electronic newspaper and that it was a source of useful information, this would be the best way to create local readership. 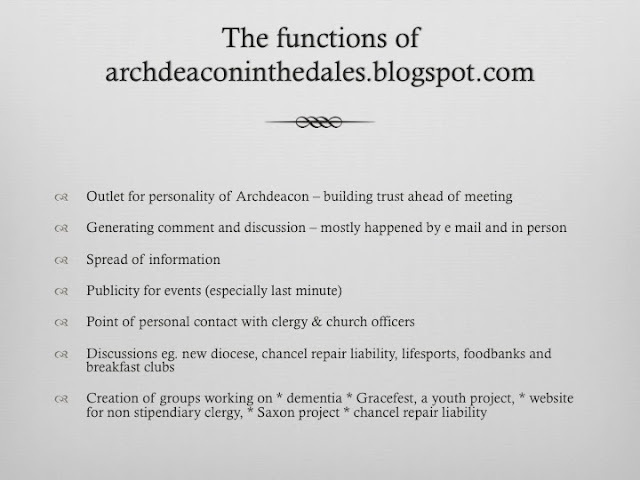 This seemed to work, along with a link on the Diocesan website which a lot of people used. 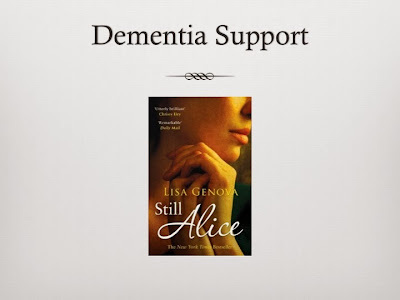 Lisa Genova writes movingly about a university lecturer who realises that she has dementia. It is the story of her progression into the disease and, uniquely, it is written from the view point of the person who has dementia. A blogpost about the book provoked a number e mail responses in which people told me their own stories of caring for someone in the family or the local community with dementia. 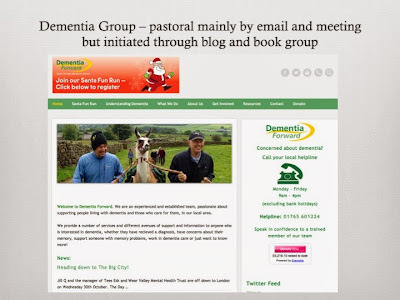 With people's permission, I put some of these readers in touch and they are still supporting one another and also, many of them, now involved in local groups working for and with people who suffer from dementia. 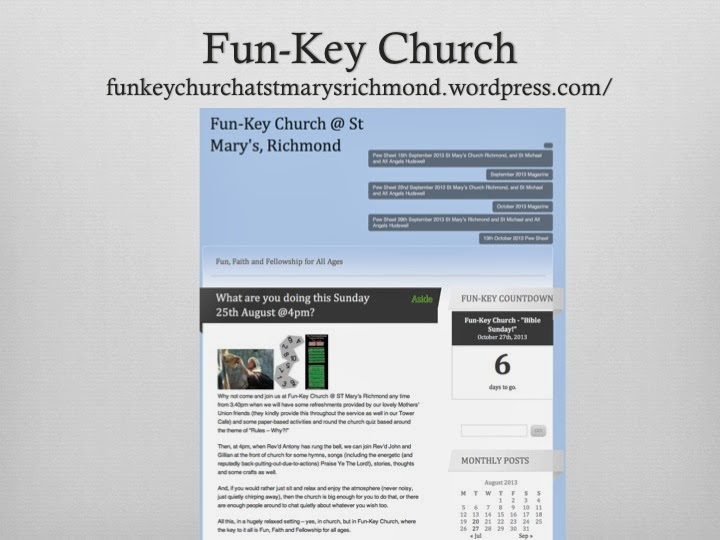 Another inspirational story is that of Fun-key Church in the market town of Richmond itself. St Mary's Richmond is a fairly traditional parish church with a fantastic choral tradition - the choristers have won many Royal School of Church Music awards over recent years. Apart form the choir and a small Sunday School, the regular Sunday services largely attracted people aged over 50. Inspired by the vision and leadership of one exceptional mum, they have created an entirely new worshipping congregation in which parent-to-parent contacts and social media have played a great part. Their leader, Gillian Lunn, has used a blog, wordpress, facebook and twitter extensively to build up the fellowship and sense of community which surrounds the worship. 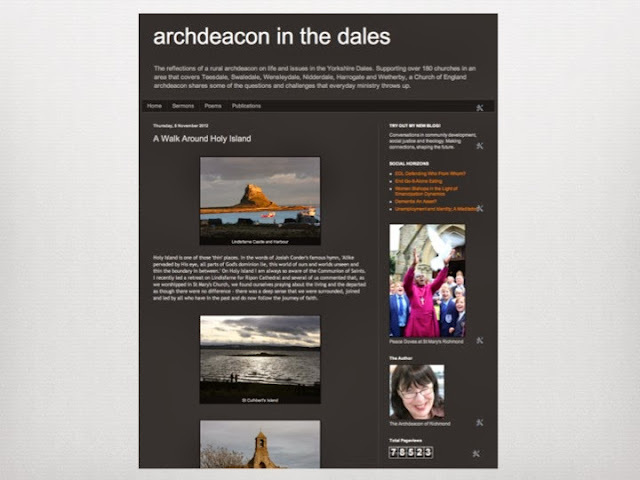 In particular, the blog is used to create a sense of anticipation - you'll see 'advertisements' - 'two weeks to go to the Archbishops of York's visit', 'one day to go to our first baptisms', 'pet service today'. The blog describes exactly what to expect when you attend a service - if you were a parent new to the experience of coming to church and you read the relevant short blog post for a particular service you would know exactly what would happen and you would be able to explain it to your child. 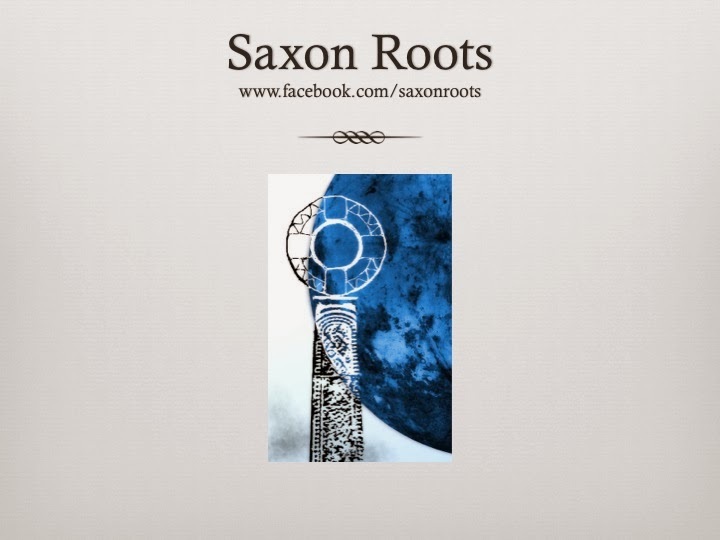 Saxon Roots is another project which is spawning new forms of worship. 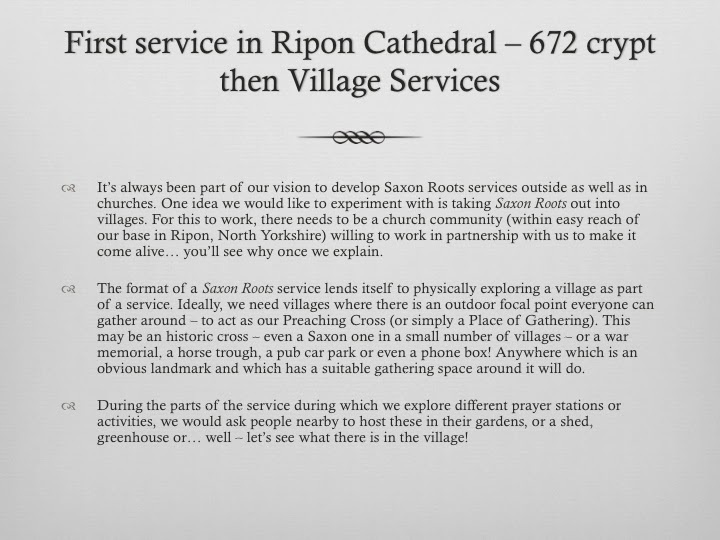 This one centres on the crypt at Ripon Cathedral which was built in 672AD. 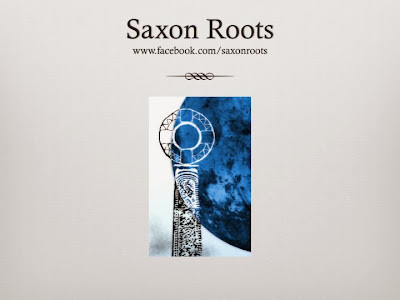 There are numerous Saxon sites around North and West Yorkshire. 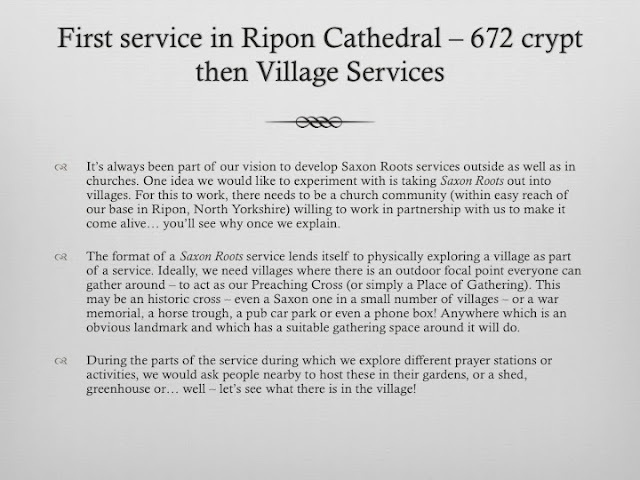 I can take you to churches where there is Saxon masonry, a Saxon preaching cross, a Saxon pulpit or font and even the remains of what is through to be a Saxon bell. 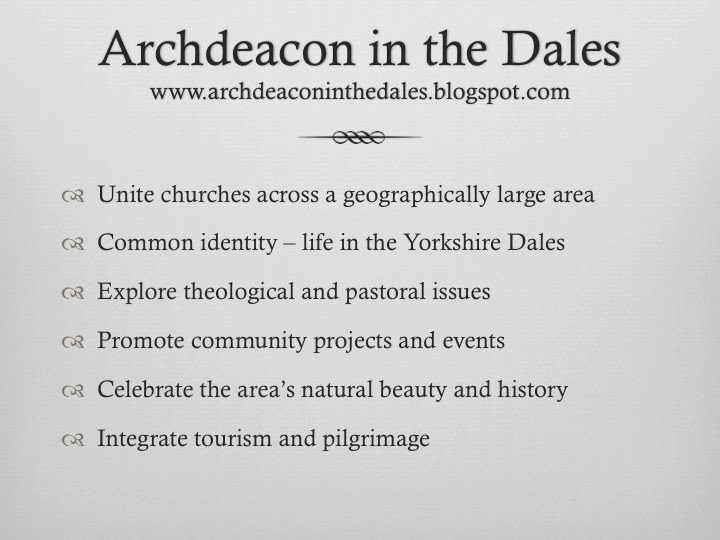 The deep roots of Christianity in the region are from the 6th and 7th centuries and these influences continue to play a part in shaping Christianity in Yorkshire today, through the location of sacred sites and the stories that are associated with them and still told. [William] Temple assumed that Christianity had a central role in society, but had to demonstrate its concern for social change. Contemporary ethicists may take the concept of reform as inherent to Christianity, but they have to ensure that the Christian faith has any credibility at all in modern British society and politics. In a pragmatic, pluralist, technologically driven world, that is a very considerable challenge. 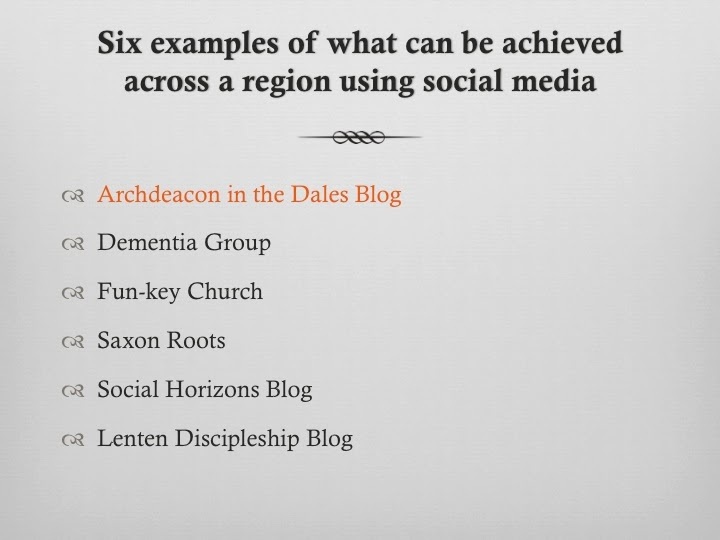 In the blog, I set out to explore the connections - I wanted to call it 'Only Connect', but that blog title had already been taken - between social justice, community development and theology. My husband, who works in an industry that spends most of its time thinking about the future, once asked me why the church spends so much time thinking and talking about the past. Social Horizons is a blog that sets out to call into play the imagination to help us think about the the future. 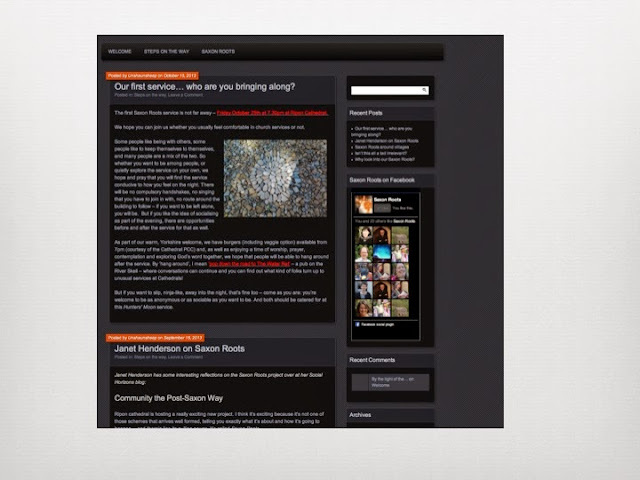 If we explore concepts of community and justice and we relate them to aspects of the Christian tradition such as the imperative to live as brothers and sisters and the expectation that Christ will return and is therefore as concerned with the future as the past, we can expect to discover insight and energy for new shapes of social being. The old saying, 'We do not inherit the earth from our ancestors; we borrow it from our children,' is attributed variously to Indian and Amish sources and to Ralph Waldo Emerson. It rings true in most cultures and is at the heart of what I am about. The way we think about society today and the decisions we make are our gifts or burdens to pass on and we should be as motivated by what we make possible as by what we have achieved. To this end, Social Horizons aims to promote the discussion of locally and nationally important issues. It attracts about 400 page views for each post and is advertised through twitter. For example, North Yorkshire has an ageing population and a higher than average incidence of dementia. There is also currently a national debate about end of life care both at a legal level (questions about whether the law should be changed to allow assisted euthanasia in some cases) and a clinical level (questions about something called the Liverpool Care Pathway which has been used by hospitals in the care of the dying but has recently come in for criticism.) Blogposts connecting these topics have brought together professionals who are concerned with the issues in their daily work and the cross discipline discussions are proving useful to all concerned. This is an example of social media enabling people who would not normally come together to contribute joined-up thinking to an area of public life. 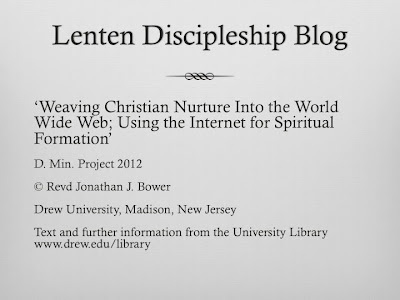 The last of my 6 projects was entirely the work of a colleague at the hospice where I work, The Revd Dr Jonathan Singh, has recently written a thesis about a Lenten discipleship blog which was used to promote discipleship through the careful use of the narratives that were told by those who participated. About 15 people took part in a password-protected blog which was moderated by a small group of faith leaders. The aim of the experience was to help the participants move forward in their spiritual life and, of course, to allow them to help each other through the use of their own stories. The spiritual formation had clear goals, was aimed at the whole person and used a range of resources and tools to assist with personal transformation. It included opportunities to engage in the practice of the present moment, disciplines of simplicity, silence, fasting and solitude, study of the faith and memorization of key texts and participation in community life. 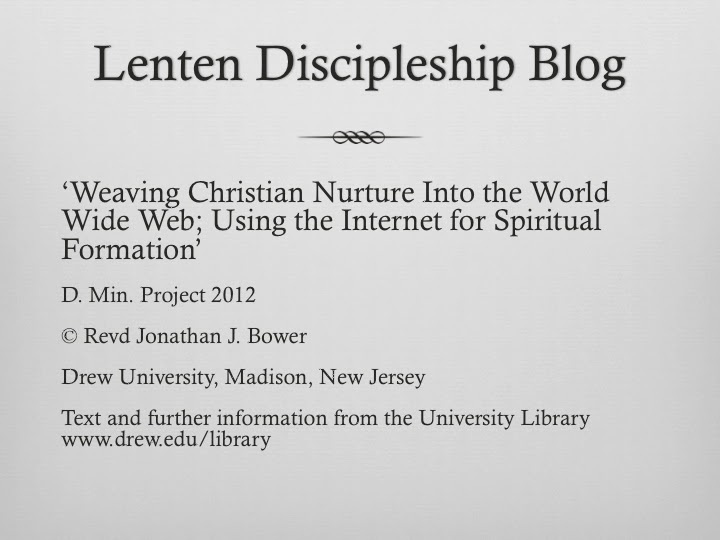 The narrative of the whole project is itself fascinating and the thesis offers reflection on the effectiveness of the use of social media in this way as a tool for promoting mature and committed Christian discipleship. 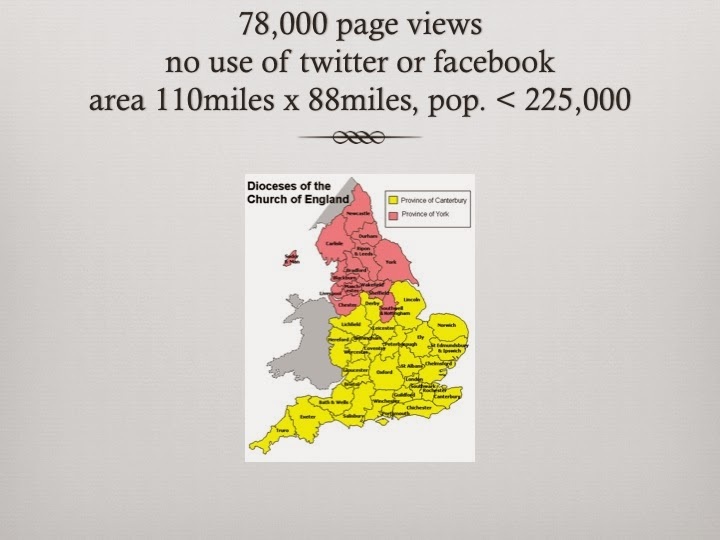 The project demonstrates, I think, an effective way for parishes to work among people of faith whose lives do not realistically or naturally bring them together with other Christians on a regular basis or in ways which allow them deep discussion or meaningful learning. 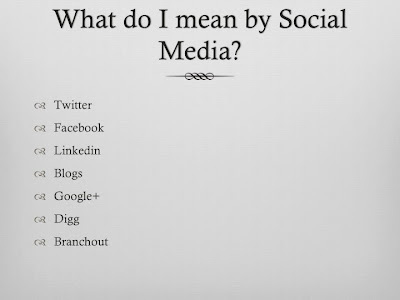 There are, of course, limitations to the ways in which social media can be used. In particular, SM challenges our preconceived and powerfully held concepts of community and sacrament - two things that lie at the heart of Christian self-understanding. It is not possible to explore these within the scope of this presentation but it would be wrong not to flag them up as areas that need considerable attention and thought. It's often said that community ties are weakened by the use of social media. I would argue that that is a an over simplification of a very complex area. Better to ask the question, 'In what ways does the use of social media change the ways we experience community?' I would suggest that the use of social media can be very helpful in helping to create relationship. For example I have used it in parishes where people would not come to the vicarage to talk about having their baby baptised without first having a detailed discussion about the nature and meaning of baptism by email - I doubt that without the initial relative anonymity of the internet there would have been any face to face contact or joining of the church community. 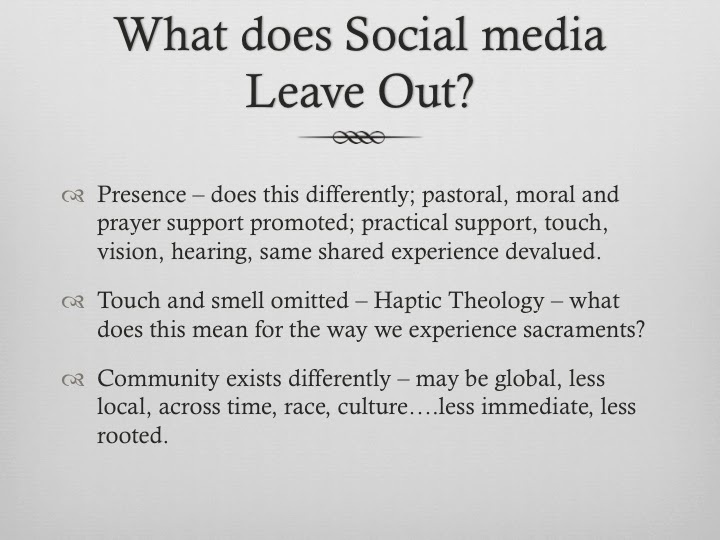 On the question of sacrament, I think that the absolute requirement to meet will always lie at the heart of the Christian faith and this will always be a corrective to the impetus to use the internet as a replacement for time-and-space community. 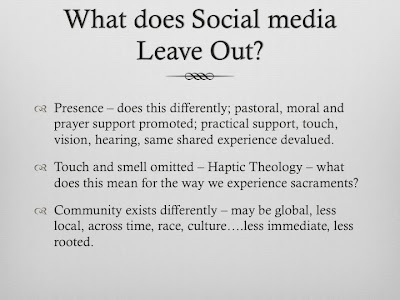 There is now a whole new discipline within theology (Haptic Theology) which is exploring questions about touch - where community forms without the immediacy of touch and smell, what does that mean for our humanness and for the ways in which God communicates with humanity through sacrament? The most important thing to take away from today is that you do not need to be a great expert in the use of the internet to develop ways of interacting with it and through it that help us understand, practise and spread our faith. 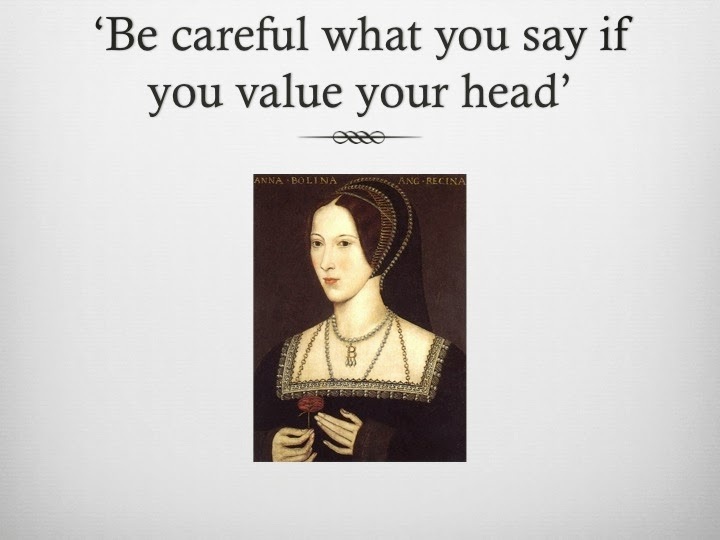 The message is 'try something small, monitor it carefully and see where it leads you!' Jesus came as Word into our world. There is, at the heart of God and at the heart of the incarnation, something which is essentially about communication. 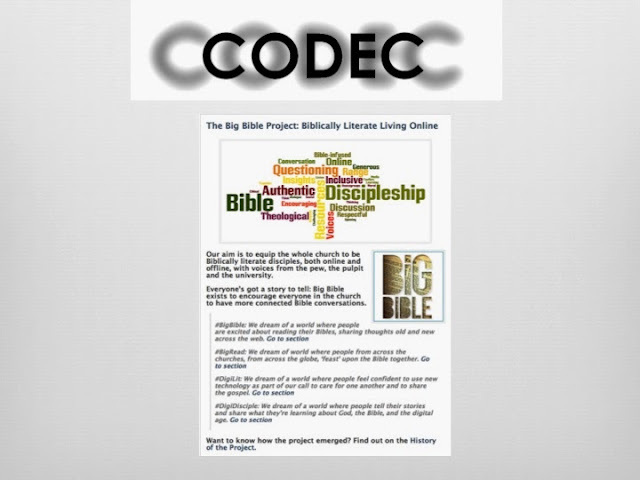 Christians are people of word and text and therefore intrinsically of communication. The internet, like any form of communication is, I believe, there to be used for good or for evil. It's essential that Christians take responsibility to learn to enter into communication through it in ways that speak powerfully of the Gospel and of the nature of God in Christ Jesus. The digital world is now as key to the shaping of life as the industrial revolution was or the dawn of printing or the realisation that the world was not flat. We should not fear it but embrace it critically. Finally, blogging, twittering, facebooking and all the other forms of media we have mentioned can sometimes appear to be about numbers - the blog that has millions of readers may be seen as more influential than the magazine that has a few thousand. Time spent on the internet may be justified in terms of the number of people 'reached'. You may even worry about the amount of time your priest appears to spend in front of the computer screen or on the iPad! However, I always maintain that we only count people because every person counts. My intention in using the internet has never been to generate huge numbers of readers but to make a lasting difference to a few. 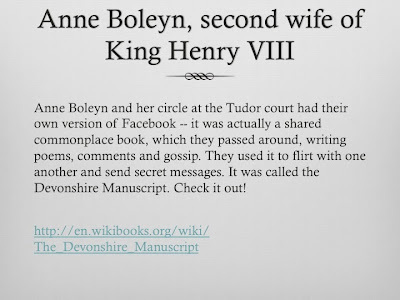 All the blogging and twittering I have ever done is made worthwhile by the one person who occasionally sits in my study and tells me how a real connection has been made, through the use of social media, that is truly life-giving. True silence is to the spirit what sleep is to the body, nourishment and refreshment. Urban Ministry; Not the End of an Era. Mindfulness or Sacrament of the Present? Currently writing and freelancing in a number of roles, my journey has included teaching theology with the Cambridge Theological Federation and being an archdeacon, parish priest, hospice manager and renal nurse. 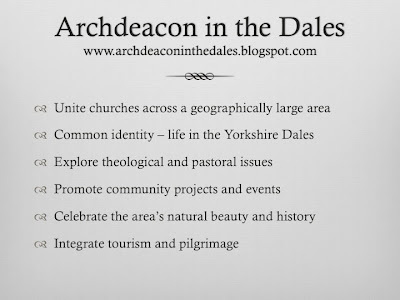 I've served as a Director of St John's College, Durham, as a Trustee and Chair of Clinical Governance at St Michael's Hospice, Harrogate and as a Trustee of Marrick Priory, an outdoor adventure centre in Swaledale. 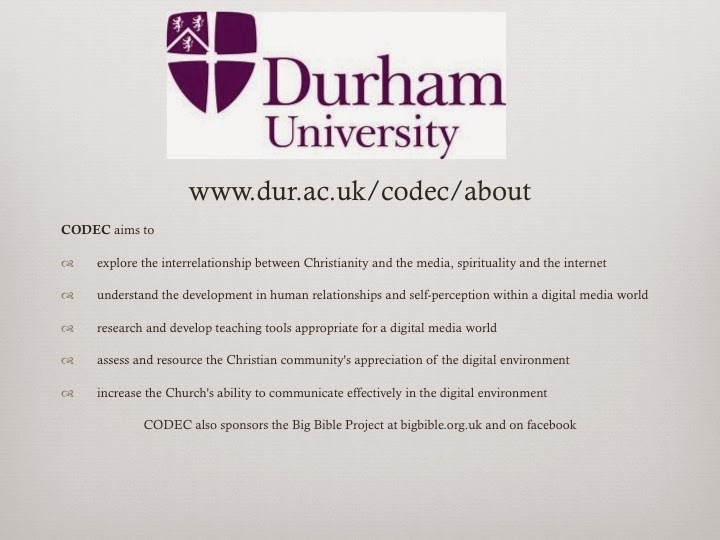 I'm a member of the Advisory Group for CODEC, a Biblical literacy and digital space project at Durham University. I attend Quaker Meeting, practise Tai Chi and love singing, playing the piano and swimming.